With many advancements in methods in which the diseases are treated, and rising competition in the healthcare field, a vague and badly-written resume will not help you to secure a nurse job. To work in this profession, irrespective of whether you are an entry-level candidate or a veteran employed in the nursing industry for years, a well-structured and neatly drafted resume will give an added advantage to your application. Every nursing profile is unique, and your resume must demonstrate points that are a perfect blend of education, professional skills, significant accomplishments, and career progression. Bullet points that emphasize abilities to provide top quality clinical care, and coordinate with interdisciplinary teams, patients, and their families have to be illustrated in the resume. Writing a strong nursing resume that rightly portrays your expertise and achievements can look like a challenging task. However, with the help of guidelines and samples present on our site, you can draft a succinct resume and compel the employer to take notice of your application. Contact information and credentials are the first thing that a hiring manager wishes to see in a candidate's application. Write a full name (as mentioned in the nursing license), residential address, contact number and a valid email address in the first section. Understand the prerequisites of a profile and analyze whether you possess the skills. For instance, if you are proficient in administering IV dosage or have expertise in handling patients in intensive care unit, these words must be placed foremost on your document. Writing a captivating objective/summary statement can grab the attention of employer, and he would like to know more about your profile. While a job advertisement specifies required qualifications and even preferred skills in some cases, the rising competition has forced the use of ATS to shortlist candidates. So under this section, demonstrate the areas you are proficient in. 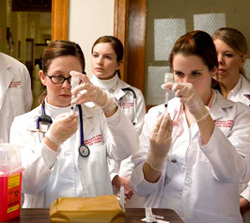 For example, you might be a pro at collecting blood, managing emergency, pacifying patients, etc. Write down everything in bullet points. List talents that demonstrate your expertise. Go for a reverse chronological order for listing work experience. However, instead of jotting down the daily tasks, make this section lucrative by writing accomplishments that an employer is searching for. It could be quantifiable achievements about responsibilities you have handled or some spectacular facts backed by strong evidence. This is the heart of your document and writing it in brief can help. At the bottom section of your document, list all qualifications that aided you to become a rounded health-care professional. Apart from the highest degree qualification (state your university name and GPA ), you can also include sub-sections that tell about the certifications, training courses, workshops, or relevant volunteering you might have done in the early days. These sections can help your resume stand apart in the crowd. The other miscellaneous sections can talk about your professional affiliations or even about hobbies/areas of interest if they are relevant. Once you have all the essential information in place, go through it again to remove unnecessary parts. Check for grammatical errors, spelling typos, and irrelevant bullet points. Try to be specific about which department you have worked for and what position you are eying on. For further help, refer to the nursing resume samples given below.